Why you should not wait for your baby, toddler, or child to get older and “easier” before you face a problem. Face it now before the problem grows. Have you ever tried to solve a problem you are having with your child only to later realize that your efforts to solve the problem actually only led to creating a larger problem to deal with? Solving a problem in a way that creates a bigger problem is called credit card parenting. On Becoming Babywise II makes reference to credit card parenting. “You will pay the training price in the future, but with compounded interest” (page 63). This statement is surrounded by so many other strong statements for parents to think about that I am sure many parents completely miss that, at least on a first read-through. Also, if this is your first child, you might not really grasp the truth of that statement so you don’t really pon der on it. The future. Tomorrow. It will all get better. We seem to believe everything will be easier in the future. My husband often makes plans for the future, believing we will have more time in the future to do things. A good friend of mine with three young children looks to the future thinking life with children will slow down…then she looks at the schedule of a friend of ours with three older children (two teenagers and one in elementary) and realizes it doesn’t slow down. It gets busier. I can’t remember where I heard it, but someone counseled to never depend on having more time tomorrow than you have today. This is wise to apply to all aspects of life. Don’t plan on tomorrow bringing you more money than you have today. Don’t plan on having more time to get things done tomorrow. And don’t plan on tomorrow bringing you a child who is more willing to comply with your instruction. What does credit card parenting mean? First, think of how a credit card works. You buy stuff using a credit card, planning to pay for it tomorrow. As soon as you buy it, you start earning interest on it. Perhaps you have a card with a grace period, but when those 30 days are up, your extra supply of cash you were hoping for doesn’t come, so again, you have to pay the interest. Now that item you purchased will cost you a lot more than it would have if you had paid with cash. It will take more money to pay for it than it would have if you had waited until you actually had the money. Not only do you owe for what you originally paid for, but at the end of the interest-calculating period, that interest is added to your total that you owe. You then owe interest on the new total for the next period–not just the first total. This is compounded interest. I have had these thoughts, also. You think the child will be more mature in the future, have better communication skills, and therefore be easier to teach concepts to. I once had a friend ask me at what age do children stop running the opposite direction when you tell them to come to you. They don’t! Children come to you when you teach them to come to you, not when they have a certain birthday. In reality, a child should mature, does gain the ability to communicate, and can process instructions better as he gets older. The trouble is you are ignoring what happens in between now and the future. 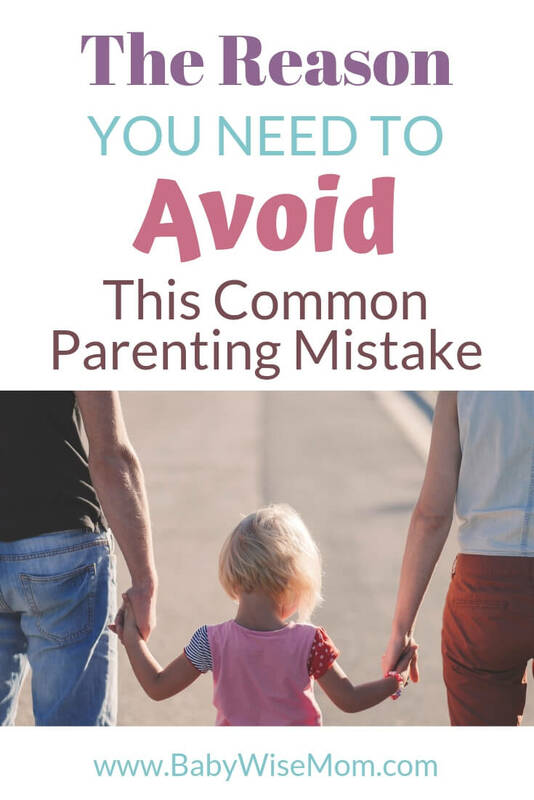 When you allow inappropriate behavior to continue in hopes of having a child who is more willing to comply with your instruction, you will be sorely disappointed. Credit card parenting doesn’t always happen because we are waiting for some later date. Often times we credit card parent without realizing it. We offer warnings and several chances. We give empty threats. We do not follow through on our expectations. We let kids get away with stuff. Your child will not be more willing to comply “later”. Your child will be confused when the day comes you decide enough is enough. You have let things slide while you have waited for this magical time when your child would be older and more mature. When that birthday hits and you decide it is time for your child to listen to what you say, your child will be expected to completely change. You will be removing freedoms that were once allowed. That isn’t going to make your child more amiable. It will likely bring out a giant tantrum. Teach your child now. Do not wait for the future. Let me note, a tantrum does not mean you have set up a big problem. Tantrums are normal. You want to face those tantrums from the first time they emerge, not give in to the tantrum to avoid it. Even teenagers have tantrums. Face them now. I must point out a few caveats here. When I say teach your child now, I don’t mean you take your 2 week old and start working on things like “Yes Mommy” and hand-folding. You teach your child when it is age-appropriate. Not sooner, and also not later. There are age guidelines for when certain training is appropriate, but you also must be the parent and evaluate your child as an individual. While evaluating your child’s abilities, don’t underestimate your child. She is capable of more than you might think. She understands a lot more than you realize. I also must warn that you don’t expect more than she is able to give. Parents often expect more of their oldest child. While it is wise to avoid using a line of credit at all costs, there are times it is almost necessary. Even Dave Ramsey is okay with a loan to buy a house. 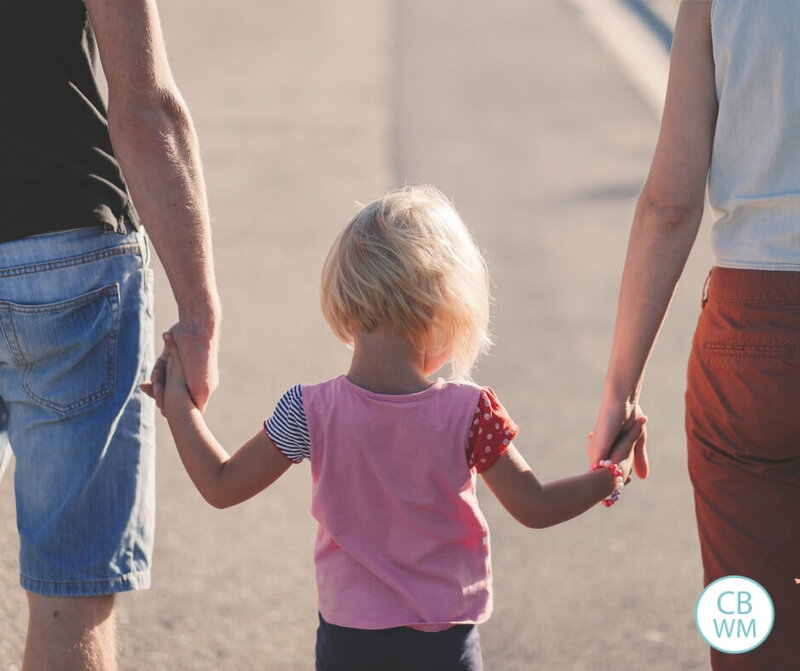 Along the same lines, it is perfectly fine to wait for your child to be ready for something before you train or move forward with a transition. If your child isn’t ready to handle the freedom of moving to a “big girl” bed, keep her in the crib until she is ready. This is called parenting in the funnel. There are many things we use with babies for sleep that we wouldn’t want to continue past the preschool years. While we want to start as we mean to go on, some debt is necessary because of the child’s age and ability. If you have let things slide and know you shouldn’t have, do not lose hope. 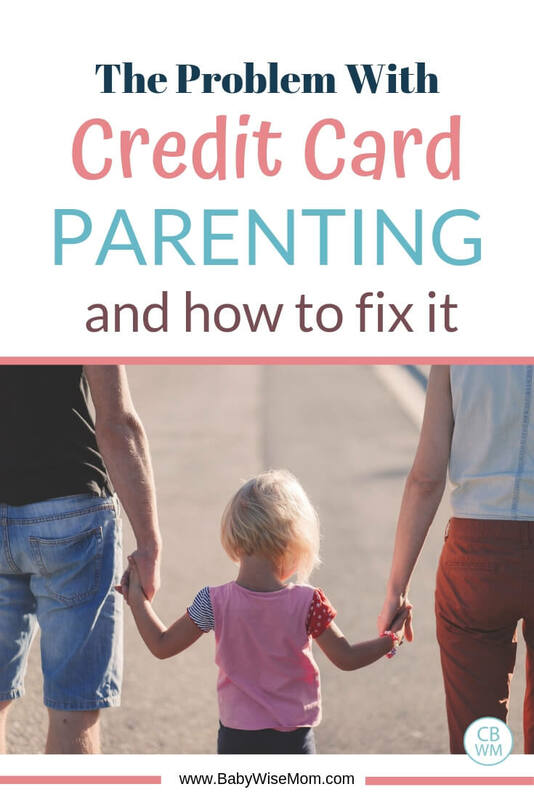 Avoiding credit card parenting doesn’t mean that if you have a 12 month old and have let certain behaviors go on for the last six months all hope is lost. It is never too late to start training your child. It might take more time and more effort to correct things, just like it takes longer to pay off something if you have accrued interest. But as the saying goes, better late than never. So when you realize there is something you haven’t started and should have or something you have allowed that you shouldn’t have, fix it. There is no time like the present. And notice I said when and not if. It will happen. You aren’t perfect. All parents realize they have let things slide that they shouldn’t have. If you can see things you need to fix, work on fixing them in a time of non-conflict. Do not address the issue in the heat of the moment, but rather wait until you are both calm. Believe me when I tell you that it is much easier to address discipline issues from the beginning. It is easier on you and easier on the child. An 8 month old is a lot more willing to comply than an 18 month old. Start now. You will be glad you did. Frankly, if you do not work on fixing discipline problems with your child, someone will some day. That might be school or in extreme cases the law. Someone someday will expect your child to listen. Be that person. Very well said. I love the quote, “Never teach something you will later have to unteach.” This was especially helpful to me as my friends would let their toddlers play with the remote control and chew on paper. I just never allowed that stuff so I never had to unteach it when it became a problem. I was wondering if you could do some polls about when people started certain things. Such as, when did you start “yes, mommy” training, when did your child start to understand “no” or “stop”, and some other common BW things. I took these principles seriously from the beginning when it comes to some common things like playing with the remote or cell phone (though I’m sure I’ve missed some things!) and it’s been interesting to see how others have responded to it. One day at my mom’s house when I took the remote away from my 8 month old, and he fussed, my mom quickly handed him that wasn’t being used to pacify him. I took it right away and explained that he’s not allowed to play with the remote. My husband one day suggested that we buy him his own remote that he can play with and I said, No, he wouldn’t understand the difference and the point is to teach him that he’s not allowed to play with remotes. I feel I’m constantly having to explain to people why I have boundaries for my baby! But I do believe that it’s all worth it. People always comment on how well behaved and even mannered he is. Angela, I agree, that is a great principle that makes toddler life much easier if you follow it! Lubbers, I sure will! Great ideas, thanks! thesprain, it is definitely common to have to explain and referee to make sure your child doesn’t play with things he shouldn’t. Keep up the good work!